The unbeaten Frankel, who was electric on the racecourse throughout 2011, was last night named Cartier Horse Of The Year at the 2011 Cartier Racing Awards. Owned and bred by Khalid Abdulla and expertly handled by Sir Henry Cecil, Frankel also takes the honours in the Cartier Three-Year-Old Colt category. The Cartier Racing Awards were announced for the 21st year running before an invited audience of 300 at the Dorchester Hotel, Park Lane, Mayfair, London, England. 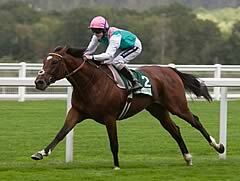 Frankel is now unbeaten in nine career starts. His 2011 season included stunning victories in the QIPCO 2,000 Guineas, St James’s Palace Stakes, QIPCO Sussex Stakes and concluded with a spectacular performance in the Queen Elizabeth II Stakes at Ascot on the inaugural QIPCO British Champions Day in October. The Galileo colt will remain in training for 2012, when he is likely to step up in distance to 10 furlongs and everyone in racing is relishing this mouth-watering prospect. In the Cartier Horse Of The Year category, Frankel saw off competition from QIPCO Champion Stakes winner Cirrus Des Aigles, Coral-Eclipse and Irish Champion Stakes scorer So You Think, Prix de l’Arc de Triomphe heroine Danedream and the 2010 Cartier Horse of the Year Goldikova. His rivals in the Cartier Three-Year-Old Colt category were the star sprinter Dream Ahead, King George VI & Queen Elizabeth Stakes (sponsored by Betfair) victor Nathaniel, Investec Derby hero Pour Moi and Treasure Beach, runner-up at Epsom Downs before taking the Dubai Duty Free Irish Derby. Danedream, who set a new race record time when winning the Qatar Prix de l’Arc de Triomphe in such devastating style, took the honours in the Cartier Three-Year-Old Filly category. The German-trained filly saw off competition from Investec and German Oaks victress Dancing Rain, QIPCO 1,000 Guineas heroine Blue Bunting and Immortal Verse, who registered two Group One victories over a mile. She is trained by Peter Schiergen for Gestut Burg Eberstein and Teruya Yoshida. 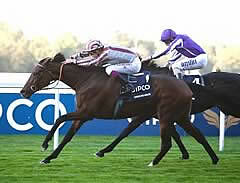 In the Cartier Older Horse category, Cirrus Des Aigles gained the honours following his success in the QIPCO Champion Stakes at Ascot on October 15, the richest race in Britain. The French gelding, trained by Corine Barande-Barbe, came out on top in a category that included last year’s Cartier Horse of the Year Goldikova, miler Canford Cliffs, So You Think and Breeders’ Cup Turf winner St Nicholas Abbey. Dabirsim went through his first season unbeaten in five outings and the Christophe Ferland-trained colt was the winner in the Cartier Two-Year-Old Colt Award, seeing off competition from the Group One winners Camelot, Parish Hall, Power and Wrote. Similarly, the Aidan O’Brien-trained Maybe enjoyed an unblemished juvenile career and she was named Cartier Two-Year-Old Filly, getting the nod over Lyric Of Light, Fire Lily, Lightening Pearl and Elusive Kate. Fame And Glory, also handled by O’Brien, made the successful transition from top-class middle-distance performer to top-class stayer and he took the honours in the Cartier Stayer category ahead of Dunaden, Duncan, Kasbah Bliss and Opinion Poll. Dream Ahead, winner of the Darley July Cup, Betfred Sprint Cup and Prix De La Foret, was the outstanding sprinter of 2011 and was the clear victor in the Cartier Sprinter Award, seeing off challenges from Prohibit, Deacon Blues, Society Rock and Bated Breath. David Simcock trained him for Khalifa Dasmal. Barry Hills, who enjoyed an outstanding training career and handed over his licence to son Charlie in August, was voted this year’s Cartier/Daily Telegraph Award of Merit winner. The award is for the person or persons who, in the opinion of the special 17-strong Cartier Jury, has/have done most for European racing and/or breeding either over their lifetime or within the past 12 months. The list of past winners of the Cartier/Daily Telegraph Award of Merit is as follows: Richard Hannon, John Oxx, Sheikh Mohammed bin Rashid Al Maktoum, the Niarchos Family, Peter Willett, Henry Cecil, David & Patricia Thompson, Lord Oaksey, Prince Khalid Abdulla, John Magnier, His Highness the Aga Khan, Peter Walwyn, the Head Family, Sir Peter O’Sullevan, Frankie Dettori, John Dunlop, the Marquess of Hartington, Francois Boutin, Lester Piggott and Henri Chalhoub. Established in 1991 to reward excellence in horseracing, the eight Cartier Awards for horses are determined by points earned by horses in Pattern races throughout 2011, combined at the end of the season with the opinions of a panel of racing journalists and votes from readers of the Racing Post and The Daily Telegraph.